Fish is a product that is needed for human consumption, to maintain the beauty and health of the body. Fish contains more protein than meat. Among the great diversity of its varieties are not always easy to choose the most tasty and healthy. Nutritionists insist that the diet of each person should include fish. It contains substances that ease pain in the joints in cases of arthritis, reduce headaches, prevent diabetes, help to regulate pressure, reduce blood fat levels. In fish in large quantities contains omega-3. They contribute to thinning the blood, thereby reducing the risk of thrombosis. Fish – low-fat product. It is worth noting that even in the oily varieties it contains only 25-30% of easily digestible fat. As a rule, fish protein is digested in the human body for 1.5-2 hours. Basically the fish are divided into sea and river. It is believed that the most delicious and healthy of sea. But in both cases have their advantages and disadvantages. Meat sea fish contains large amounts of useful for human organism substances: minerals (zinc, iron, lithium, boron, fluorine, bromine, phosphorus, copper, manganese, iodine, calcium, magnesium), vitamins (A, E, D, F), polyunsaturated fatty acids, amino acids (methionine, tryptophan, lysine, taurine). 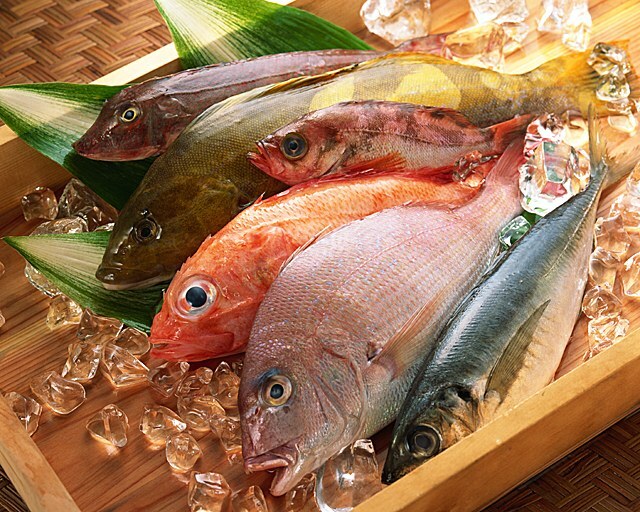 Thanks to this composition, fish is a favorite among dietary products. Dishes made from sea fish, is not only delicious, but also useful. For example, eating daily 100 grams of this product, you can reduce the risk of cardiovascular disease. Minus the marine fish has a very high cost compared with river. This is especially true of aquarium live and chilled fish. One of the main advantages of river fish is considered to be its accessibility. It is always possible to buy fresh close to home. In comparison with marine fish, freshwater inhabitants is much cheaper. Meat river fish also contains a large amount of useful minerals. It is a great source of protein. However, the meat of river fish is considered less pure and delicious than the sea. This is easily explained. Freshwater fish lives in the environment most polluted with heavy metals, pesticides and radionuclides. In addition, freshwater fish are much inferior to the marine seafood in the content of useful amino acids, minerals and microelements. Among salmon in taste and useful qualities include: salmon, pink salmon, chum and trout. Their regular use improves vision, helps prevent cardiovascular disease, slows the aging process of the body. The best way of cooking salmon – salting. It is worth considering that when heat treatment is the destruction of valuable substances. The cod, haddock, Pollack, hake and cod no less pleasant to the taste. In addition, they have a high content of vitamins and proteins and are the diet of all the species of fish. Treacle breed is commonly boiled or baked. Also they make great burgers and meatballs. And cod liver oil is an undeniable source of nutrients.